At a show like PAX East, there are thousands of moments that tell a story. Out of hundreds of photos we capture while at events, sometimes we capture moments that speak for themselves. 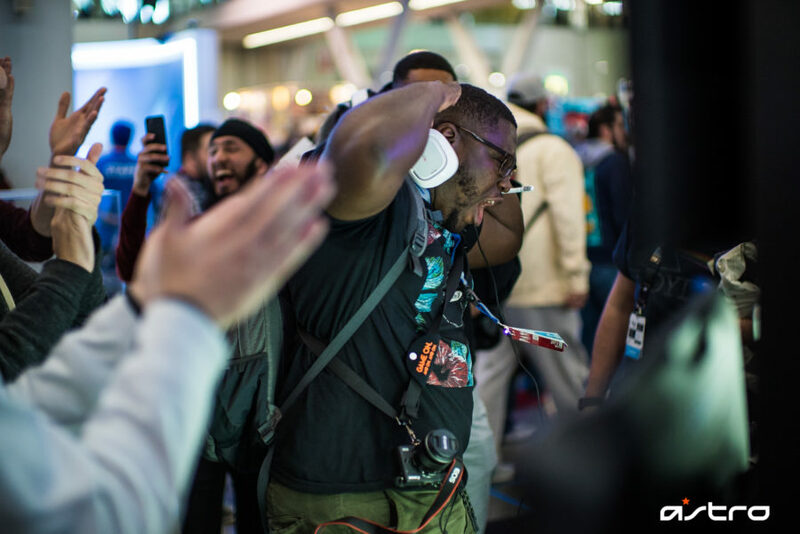 Our photographer Vaughn managed to catch a Victory Royale (Fortnite) in-process, winning an ASTRO Jersey, PAX East Pintrill Pin, and Scout Backpack! Excitement is contagious in victory, and this photo has managed to preserve that excitement. We love playing to win, which is why we do what we do. Our goal is to expand and enhance gaming, so when we are able to contribute to a victory and the joy that brings, we’re stoked. It’s a pretty cool feeling knowing we all share that joy and passion, and when it all comes together for a win (and a massive haul to boot!) we can’t resist sharing it with the ASTRO family! Everyone in this photograph is caught up in the same moment: bringing people together because we love gaming is what it’s all about for us. PAX East 2018 is over, and we hope those who were able to attend enjoyed being there as much as we did! And for those following along at home, we hope we were able to bring some of the awesome that is PAX East to you wherever you are. Thanks for another great show, #ASTROfamily! Thanks for following along with us! See you at PAX West!